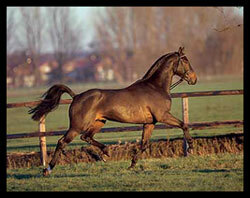 Quality, dark brown Hosteiner Stallion, by (Quinar / Lantaan) born in 1999, standing approximately 16.3 hands. The name is the game! A highly refined Holstein stallion with a large profile and always uphill. A jumper with a good spirit and clear mind and great rideability. Jumping is an easy game for him. 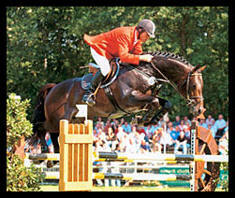 Quality absolved his 30 day test in Prussendorf in 2002 with top scores between 9.0 and 10.0 in all of the jumping criteria. He has meanwhile won numerous medium and category A medium level tests for young jumpers and jumpers. 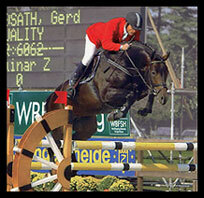 In 2004 and 2005 he was highly successful at the Bundeschampionat for German jumpers, winning a qualification with 9.0! He also successfully participated in the World Championships for show jumpers in Lanaken. His sire, Quinar, is a Quidam de Revel son. Quinar presented two overwhelming premium stallions in Holstein in 2003, who demonstrated a class of free jumping that had never been seen before at the Holsten Hall in Neumünster. This was rewarded by the absolutely sensational price of 400,000 Euro for one of them and Quinar immediately returned from Zangersheide to Holstein. Quality's dam, Cordelia, is a representative of the famous “Roman” line 18B1 and is a daughter of the versatile sire, Lantaan, who landed an approval winner with Lucky Lionell and frequently exerts a strong influence via good quality mares. Cordelia had already presented the licensed stallions Legendär I und II (both State Stud Schwaiganger) and her granddam, Pracht, was the dam of a licensed stallion named Lionell. In 2005 Quality achieved an index of 155 from the Holstein Verband for his outstanding foals.